Despite flight delays on their return from a trip to the Super Bowl in Atlanta, Timmerman and his family returned to Iowa in time for son Mason to get to his 11 a.m. class and for Timmerman to present “Some NFL Economics From a Former Player’s Perspective" to the Econ 313 class. 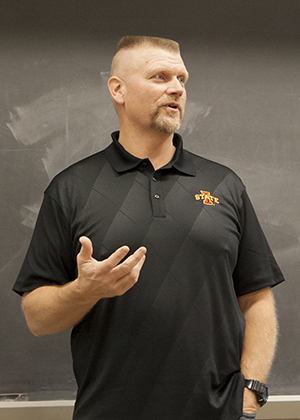 Afterwards, Timmerman answered questions from the audience of 106 students ranging from the economic aspects of working for the NFL, to his personal experiences of his athletic career. This was Timmerman's second year addressing the Econ 313 class.